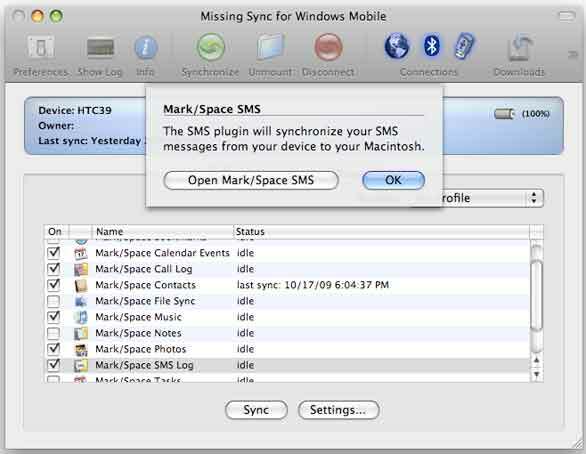 For syncing Macs with Windows Mobile smartphones, The Missing Sync for Windows Mobile from Mark/Space has been the top solution. Version 4 adds support for new types of data syncing and the ability to move phone logs and SMS messages to your Mac. But it still lacks e-mail syncing, something you can find in SyncMate Expert ( ), Eltima Software’s competing product. The Missing Sync can move contacts, calendars, iTunes music and playlists, files, and other data over USB, Bluetooth, and Wi-Fi, depending on the connection types your phone supports. For most data types, you can do two-way syncing or overwrite data from the phone or the Mac. With video, you wouldn’t want to move all your Mac’s video to your phone, so The Missing Sync has you drag video files from the Finder into The Missing Sync’s window. The software then automatically converts the video to MP4 format and copies it to the phone. You can also have the utility move all video taken with your phone into iPhoto or any folder on the Mac. Similarly, you can configure The Missing Sync to automatically downsize and move photos from selected iPhoto albums, as well as move photos taken with the phone into iPhoto or to a folder. The new Call Log feature lets you move a record of calls on your Mac. A similar SMS Log feature gives your Mac a record of your sent and received SMS messages, which are searchable with Spotlight. With both, you can add a contact to your Address Book with the click of a button. However, these features are one-way—you can’t send a text message from your Mac, as you can with Eltima’s SyncMate. The Missing Sync has a unique feature, however, of being able to backup everything on your phone to your Mac with the Backup My Documents button. I like the Profiles feature, the ability to save different sets of syncing settings. This lets you choose among different combinations of data to sync at different times. I wasn’t so crazy about the ever-present menu in the Mac’s menu bar, similar to a simplified Start menu. It’s fine if you like it, but there’s no way to remove it if you don’t. The Missing Sync for Windows Mobile 4.0 can sync a lot of types of data, including SMS messages. I reviewed The Missing Sync for Windows Mobile 4.0.5, the first build for Snow Leopard compatibility. Although there were no problems with Snow Leopard, there were occasional glitches in setting up, connecting, or syncing. Often disconnecting and reconnected the phone resolved the problem. Where it didn’t, The Missing Sync’s error messages were useful, often including a link to a Web site article telling you how to fix the problem in the utility or on the phone. The Missing Sync also warns you if your Mac’s computer name is more than 20 characters. If it is, you’ll have trouble with syncing with a Windows Mobile device. Configuring some tasks, such as setting up video or syncing with Microsoft Entourage, is difficult to figure out by yourself. (For example, with Entourage 2008, make sure that Entourage is not selected in the main window.) This is compounded by the lack of a PDF manual—you have to use the Help system. But following those instructions don’t always get you there, because the how-to instructions in the Help system sometimes left out a step, such double-clicking an item. Even worse, the Help instructions for Entourage 2008 contained errors. You’ll have to search the Mark/Space Web site to find the correct directions. Once you set it up, The Missing Sync for Windows Mobile 4 will do the job for syncing a variety of types of data with your Mac. But if you want email syncing, you’ll need to use Eltima’s SyncMate.